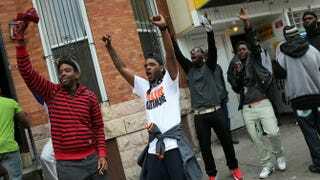 Baltimore residents celebrate at the corner of West North and Pennsylvania avenues after Baltimore authorities released a report on the death of Freddie Gray while police in riot gear stand guard on May 1, 2015. When Baltimore City State’s Attorney Marilyn Mosby announced Friday that charges would be brought against the six officers who were involved in the fatal detainment of 25-year-old Freddie Gray, some people in the crowd erupted in cheers. “Thank you, Jesus!” someone yelled. “Yeah!” exclaimed another. “To the people of Baltimore and the demonstrators across America, I heard your call for ‘no justice, no peace,’” Mosby said during the press conference. A crowd erupts in cheers. One man reacts positively to the news in front of Baltimore police officers. A woman and young child raise their fists—a gesture that has come to symbolize black power—to commend the decision. One man gets on his knees to pray. Baltimore natives get out of their cars and cheer. A Baltimore man crosses his arms in an “X” position. More black power gestures from Baltimore natives. A protester holds up a sign bringing attention to excessive police force used on unarmed African-American men.